In the age of the internet where all forms of information can be accessible from our homes at the push of a button, it will become difficult for future generations to identify genuine from false information. In order to privilege truth over error the library can in future stand out as the true locus of social knowledge in analogy to the metaphor of Noah’s Ark riding over the flood waves of information. In the same way the ark welcomed all the different species of animals, the library is to welcome users from all social backgrounds and beliefs. Perhaps this will be the future of the library for generations to come. Stemming from this inspiration the form of the library is derived by the notion of the Ark as a holder of knowledge. Being positioned directly in front of the Finnish Parliament, the first contextual intention of our proposal is to respond appropriately to this setting. The relationship between the Parliament and the Library is seen as analogous to the relationship between politics and education. This is a key relationship that our proposal seeks to emphasise and engage by favouring a visual dialogue between the two buildings as independent and separate bastions of civic society that are however always engaged in dialogue and mutual reinforcement. The hope is that in favouring visual dialogue between the library and the parliament we will also encourage dialogue between the different users of the library itself. Fundamental to the distribution of knowledge was Joahnnes Gutenberg’s invention of movable type around 1439. The shifting polychromatic panels of the facade recall Gutenberg’s discovery of the endless possibilities of printing created by the shifting characters of a typeset library. The proportions of the rectangular panels on the facades will be based on the Golden Ratio proportion, which as an idea dates back 2,400 years to the times of Pythagoras. The Golden Ratio was studied or was present in works by Pythagoras, Phidias, Euclid, Fibonacci, Pacioli, Maestlin, Kepler, Bonnet, Ohm, Lucas, Barr, Penrose, Dali’, Le Corbusier, Bartok, Debussy, Chopin and many others. It is proposed that specific panels will be decorated by references to words and works of the above, and many other personalities and shapers culture. The appearance of Sirén’s Kalvola granite Finnish Parliament is consistent with the neo-classical belief that the architecture of antiquity was finished as the mono-chromatic marblethat was found in the archaeological sites of ancient Greece. Jacques Hittorff, the architect of Place de la Concorde in Paris, was the first to publicize the belief that the architecture of antiquity was in fact poly-chromatic, and he published these findings in his paper of 1830 called Architecture polychrome chez les Grecs. 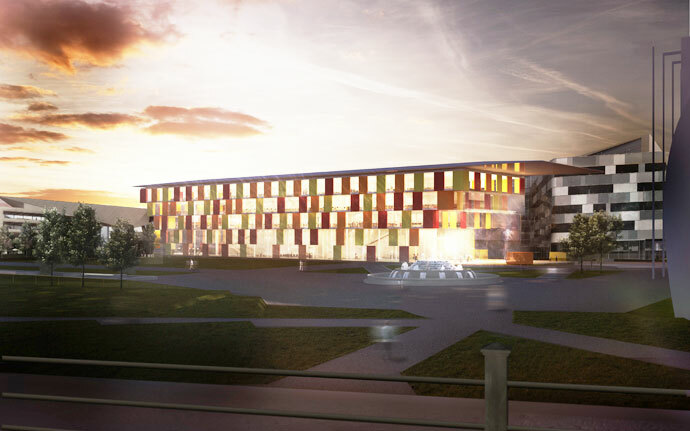 In the Central Library we set up a visual reference to the Finnish Parliament building with the further knowledge passed on to us by Hittorff and apply polychromy to the facades by using coloured ceramic panels inspired by the original reconstructions of the civic buildings of antiquity. The Parthenon was the temple dedicated to Athena, the goddess of wisdom, civilization, law and justice, mathematics, strategy and the arts and crafts. As such the Parthenon can be seen as an early pre-cursor of the library. In order to select the polychromy for the Central Library we turned to this earlier incarnation of the library as a temple dedicated to wisdom and knowledge. Alexis Paccard, the architect of the Palace of Fontainebleau near Paris, produced a study of the polychromy of the Parthenon. The chosen colours taken from Alexis Paccard’s illustration of the Parthenon and used in the Central Library are yellows, oranges and reds, and are meant to provide a stark contrast with the whiteness of the snow in winter, making the building visible from the distance of the Parliament even under heavy snow-fall. 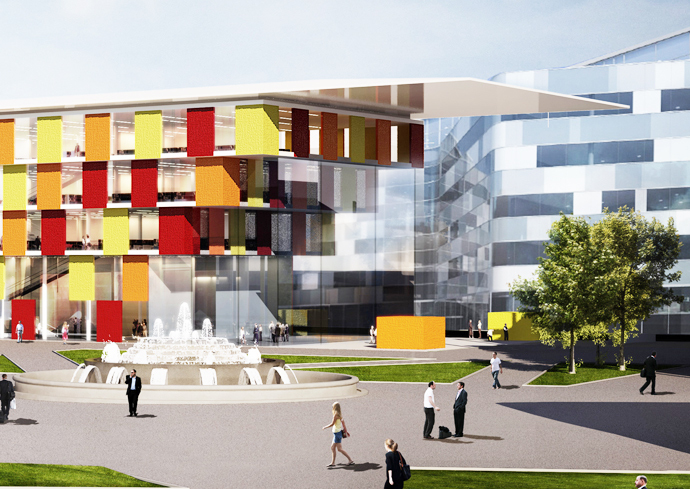 The library will fit within the site boundaries and heights determined by the urban plan. The main entrance will be to the South with further separate entrances to North for the cafe’ restaurant, East for the commercial shops and bookshop, and West towards the park and Piazza. 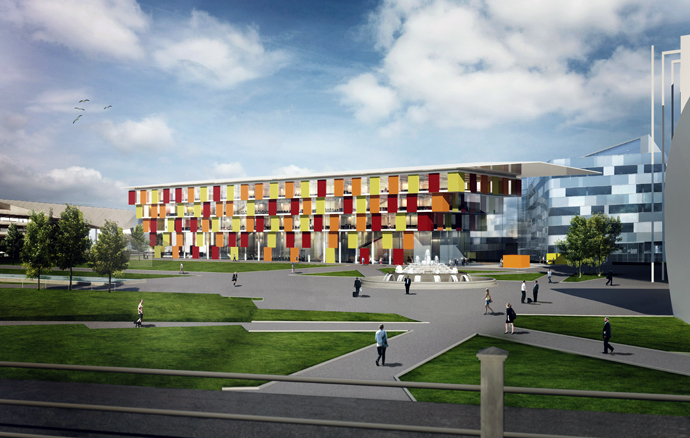 Towards the South, the end of the building that will face towards central Helsinki will be a glass atrium, shielded by the sun by an overhanging roof. 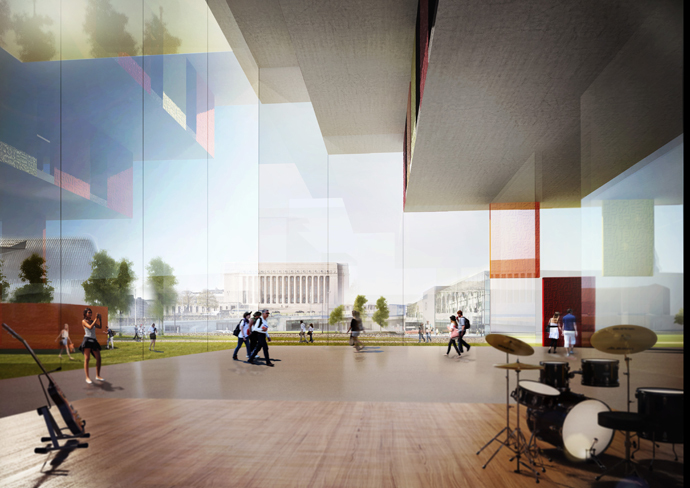 The atrium will provide a direct visual relationship to the Parliament building, the new Piazza, Kiasma, the Sanoma atrium, and Elielinaukio Piazza. The atrium will host the stage for performances, which will be viewed from the Piazza as well. The overhanging roof will provided an outdoor public space that will allow further views to the performances inside the atrium (loudspeakers can transmit audio from the atrium to the outdoor space), and also outdoor performances. This public space under the roof will be protected from rain and snow and welcome users of the Piazza and the Park towards the library entrance. According to the classical historian Herodotus, at the top of each ancient ziggurat was a shrine, however the top of the ziggurat also served the purpose of protection from the occasional flood. Two internal covered light wells bringing zenithal light to the lower levels of the library are shaped like two elongated inverted ziggurats. These stepped terraces forming the edges of the ziggurat voids will allow views to and from the different levels, engaging users in a sense of visual communication and connectedness between people on all different levels of the library.